With the notable exceptions of the martyrdom of St Cuthbert Mayne and several others the bloody persecution of Catholics under Queen Elizabeth I did not begin in earnest until more than 20 years into her reign. This frenzy of persecution was triggered by real conspiracies to remove the Queen, by her excommunication by Pope St Pius V and by the hysteria that accompanied the arrival of the Jesuit St Edmund Campion on the English Mission in 1580. St Edmund and his colleagues brought to an end prevailing confusion over whether Catholics could in good conscience obey laws that compelled them to attend new Anglican services. Catholics were assured that they could not. Blessed Robert Johnson, born in 1544 in Shropshire, was one of 19 priests who stood trial with St Edmund in Westminster Hall in the late autumn of 1581. They were charged with treason under an Act of 1351 that did not pertain to religion but to a fictitious conspiracy against the Queen known as the “Plot of Rome and Rheims”. The purpose was to send out the message that the priests were not condemned for their faith but for conspiring against the Queen, an accusation which they adamantly denied. During the trial Blessed Robert gave evidence against claims by George Eliot, the renegade Catholic who betrayed Campion, that he and St John Paine had tried to persuade him to join a plot against Elizabeth. All the defendants were convicted, however, in spite of the lack of evidence against them. Campion, St Ralph Sherwin and St Alexander Briant were executed almost straight away. But Blessed Robert was held in custody until 28th May the following year when he was drawn face down on a hurdle to the Tyburn Tree along with Blessed John Shert, another Shrewsbury priest, and Blessed Thomas Ford. Blessed Robert was the last to die, after being forced to watch the quartering of Blessed John. He went to his death vowing his loyalty to the Queen and protesting his innocence of treason, saying: “I teach (nothing) but the Catholic faith”. Blessed Robert had grown up in one of the four parishes of Claverley, Hales, Owen or Worfield in what was then the Diocese of Worcester. He worked as a servant in a gentleman’s family before he entered the German College in Rome at the age of 28 years. He was not an academic and he suffered from poor health, but he was described by Father Robert Persons, the Jesuit leading the English Mission, as a “very good and godly little man”. 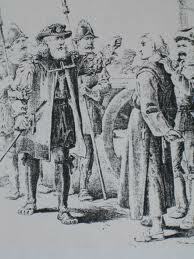 He was ordained priest in 1576 and arrived in England on 2nd May 1580. He was about to cross the Thames to the synod of priests at Southwark, famously attended by Campion, when he was betrayed by Charles Sledd, a former servant at the English College who had turned into an informer. During his incarceration in the Tower of London he was racked three times, held in a pitch-black dungeon and forced to listen to sermons by Puritanical ministers. Blessed Robert is commemorated as one of the London martyrs of 1582 and in the Catholic high school of his name in Wellington, Shropshire, the county of his birth. A stained glass window depicting Blessed Robert (right) was commissioned for St Patrick’s Church, Wellington, in 2006 to mark the centenary of the parish. The image was based on the only other depiction of Blessed Robert in stained glass – at the Holy Name Church, Oxton. Sources: Memoirs of Missionary Priests by Bishop Richard Challoner, Nine Martyrs of the Shrewsbury Diocese by Kevin Byrne, Edmund Campion by Richard Simpson, and Butler’s Lives of the Saints.